The Portland Water District announced the opening of its Sebago Lake Land Reserve in 2005. The 1700-acre Land Reserve, located in Standish, is open to the public for passive recreational activities. 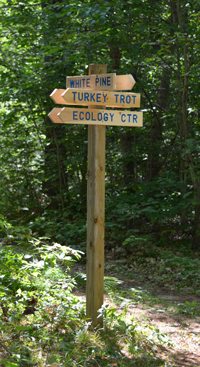 Most portions of the Land Reserve contain trails, including the Sebago to the Sea Trail and the Mountain Division Trail. The most contiguous trail network is housed within the Otter Ponds parcel. Trail maps are also available at any of the twelve kiosks, or you can pick one up at the Sebago Lake Ecology Center. PWD offers guided events on the Land Reserve several times a year. Check back for information about upcoming events, or like us on Facebook to receive updates.